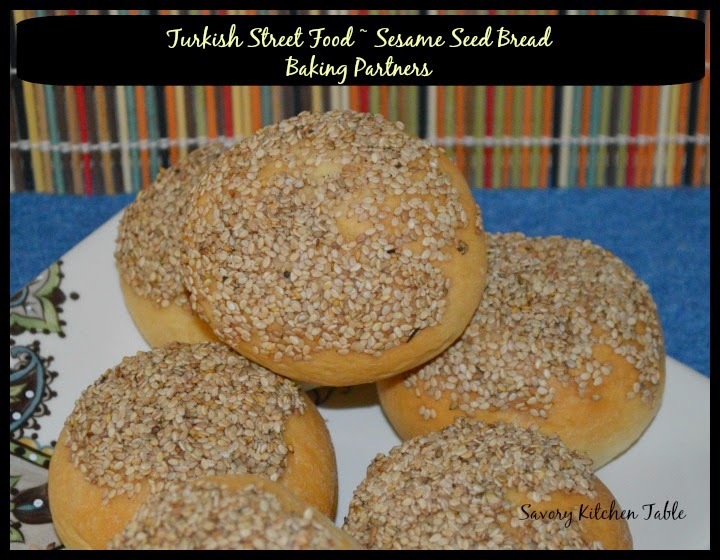 Simit: Turkish sesame seed ring bread - I made mine round hoping they'd be fluffier inside. They are typically made in rings like a round pretzel. LOL they should have been rings, but I wanted something more traditional looking for dinner that night so just made plain old rolls out of the dough. **If using active dry yeast, then dissolve yeast in 3 1/2 ounces warm water and let it stand for 3-5 minutes. Turn out the dough into a lightly floured surface and punch down. Knead for 2 minutes. Divide it into 12 pieces and shape them into long rolls. Take two rolls and form a twisted rope like this. Dissolve the molasses in 1/2 cup water. Set aside for 20 minutes for a second rising - it needs to plumb up a little. Bake them for 20-25 minutes or until golden. LOL they should have been rings, but I wanted something more traditional looking for dinner that night so just made plain old rolls out of the dough.